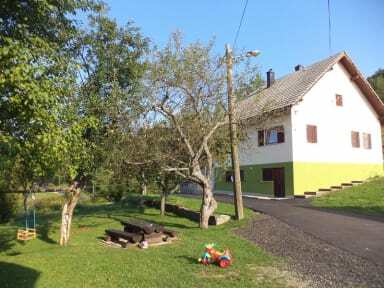 Guesthouse Loncar is located in Poljanak, 3.5 km from the Entrance 3 to the UNESCO-listed Plitivice Lakes. It is surrounded by greenery and provides a garden with barbecue facilities and a shared terrace. Free on-site parking is provided. We have also free WiFi. We speak your language! Guesthouse Loncar is set above Korana Canyon. You can enjoying hiking in the surroundings.The nearest grocery store is about 300 metres away. Local bus stops 500 metres from the property. Room here will comprise a wardrobe and a seating area. Featuring free toiletries, private bathroom also come with towels. A shared kitchen with dining area is at guests' disposal. 24 hour Reception. Our reception is open during the whole day - only for You. There is no age restriction. Here is very nice to come with the little children because the house is far from the main street about 50 meters, so you can left and walk with your children and do not worry for the cars or traffics.